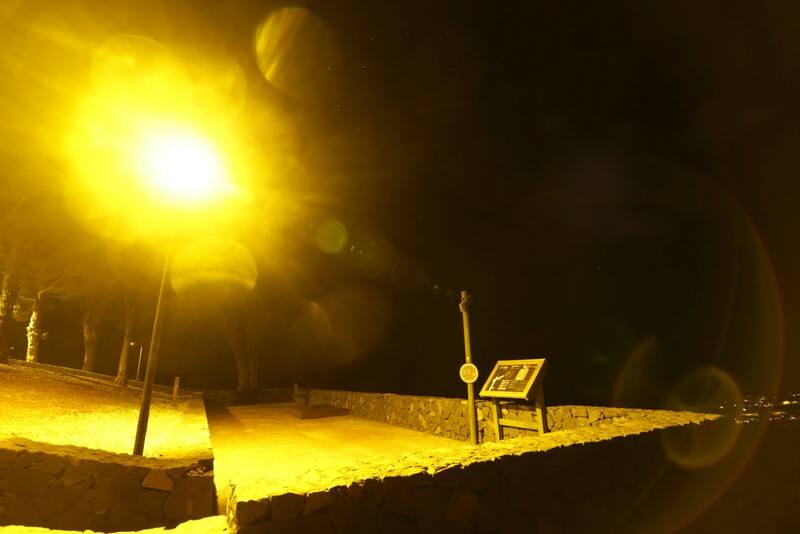 One of La Palma’s astronomical attractions is a network of 14 astronomical viewpoints. They are distributed across the island and are equipped with information panels: Some explain constellations, others the planets, the Moon, or other aspects of astronomy. Each one also has a sign that points to Polaris, the northern star. It’s a nice idea, designed for tourists and residents alike (you can find a detailed description of each viewpoint here), which, and I quote the official website “make the most of the dark places”. However, if you are looking for a dark place to watch the stars, some of La Palma’s astronomical viewpoints are ironically not where you want to go. As a group of amateur astronomer complains in this article (here’s another one), some of the miradores have been equipped with illumination fixtures in the past months, and are now brightly lit even until the early morning hours. This is the opposite of what you want at a stargazing viewpoint, but it’s in line with a troubling trend that I can confirm by own experience: During the past year and probably even more so in 2019, one secluded and formerly dark place after the other is being illuminated, even if nobody lives or transits there at night. One of my favorite examples is the Mirador de Miraflores in the northwestern town of Puntagorda (see image above). It is illuminated all night. One of the lightings is placed so close to the information panel that watching the stars from here is a mere joke. It doesn’t help that these lightings comply with the sky law when you’re standing right beneath them. They simply should not be there. There is also an economic component to this problem. Some tour agencies offer guided astronomical tours to tourists, and the viewpoints are a natural choice as observing sites. Unfortunately and very ironically, finding a dark and accessible stargazing site on the so-called “stars island” La Palma is now harder then ever.